For many people in Naples, the idea of a home that provides a winter escape has drawn them south from frigid climates. With a little more time on their hands due to retirement, and after years of financial planning to make their Naples dreams come true, they set out to find the right retreat. In an incredibly hot real estate market, people can quickly realize that finding the perfect second home might be a bit of a challenge. Prices, location, age, and style rarely come together at the right time. That’s where a remodel becomes the best option. It can help eliminate the age and style conundrum and narrow down the requirements a potential buyer needs to consider. Knowing that the ability to change an aging home in a great location exists can open up a whole new world of real estate possibilities. That’s exactly what happened with this three-story townhouse close to Old Naples. Good location, good bones, and a decent overall layout led the new owners to purchase the home knowing they could trust ARCS Construction to make the needed updates. Like most remodels, some of the extensive work will remain unseen. New air conditioning and heating were installed and dehumidifiers were added to protect the home from the moisture of the nearby Gulf of Mexico. Wallpaper was removed from almost every room which was one of the most dated aspects of the home. 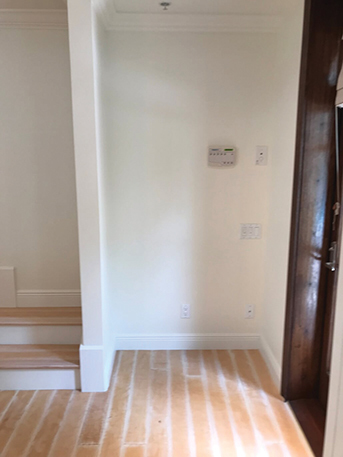 Control4 lighting was added allowing the owners to program their own personalized settings and now motion-activated lights automatically turn off and on in all the closets to conserve energy. In the kitchen, the original double islands where removed and replaced with a single, more functional one. The two islands made the kitchen feel cramped and good design will never make a home feel smaller. Now, the large island is topped with a beautiful Super White Extra Marble counter and a gas range. The new white shaker cabinets are modern and clean, providing the perfect base for the gold metal pulls. The original bank of tall windows above the sink illuminates the space. “The new owners liked the existing french doors so we refinished them to update the look and add a little more visual interest,” says Hartz. Just off the kitchen is the dining room and family room. This downstairs living area provides the right amount of room without feeling unmanageable as a winter retreat. Beams were added to create a more finished look and add a beautiful design element to the main living space. Through the French doors beyond the dining room, the newly refreshed landscaping creates a more polished indoor/outdoor experience. The beautiful bar with custom Walker Zanger tiles now replaces the original odd staircase design. “The stairs had two really large bottom steps that extended across almost the whole wall. There was a tiny space for a bar but no shelving and really not enough room to make a functional drink space,” Hartz explains. By reducing the size of those two steps to match the rest of the staircase, the bar is now a stunning focal point and a functional space for entertaining. The floating glass shelves keep the view of the tile unobstructed and the cabinets below are stained to match the french doors. The upstairs provides the new owners with the master suite, home office space, laundry room, guest room, and a flex space on the top floor. The laundry room is now light and airy thanks to the fun blue cabinets and the beautiful white subway tile accent wall. 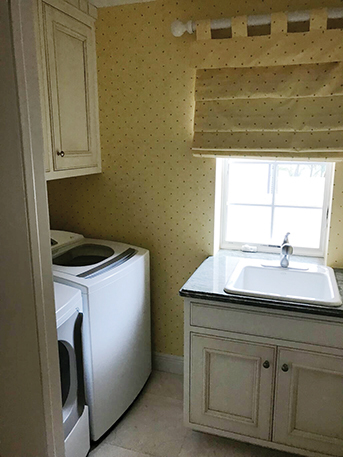 The stacking washer and dryer meant there was room for counter space, an important aspect of any well-planned laundry room. Throughout, the floors were replaced with a natural wide plank wood. This color is becoming increasingly popular in the Naples market. It’s modern enough to be used in a transitional design and works well with the coastal feel many homes have. Here, they accent the nicely-sized master bedroom. This room looks twice as big repainted in crisp white from floor to ceiling. 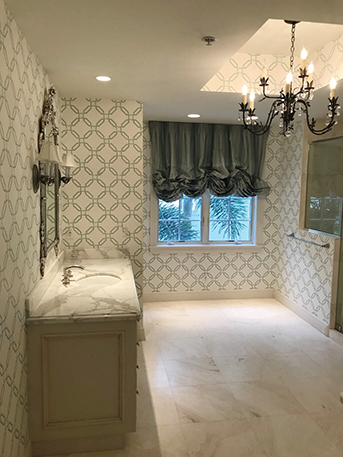 The master bath was once a wallpapered and dated space. “There was plenty of room for a tub but one was never put in leaving this gap in the room,” says Hartz. Now, the tub brings a sense of completion and keeps the room proportionate. New lighting and counters give the original cabinetry, painted for a new lease on life, a touch of glamour. Images of the bar area, laundry room, master bath, and master bedroom before the remodel. ARCS was founded in 2009 by brothers Michael and Steve Peel to complement their already established new home division Gulfstream Homes. They, along with their partner, Jeneane Bennett, pride themselves on their excellent work, experienced team, and extensive referral network of happy clients.